Be prepared as the world comes to an end with the ZK (Zombie Killer) Death Dagger Fixed Blade Knife from KA-BAR. 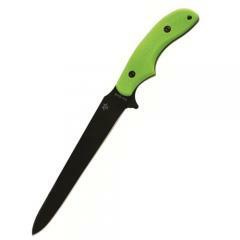 Designed to offer maximum protection in close quarters battle (CQB) situations, the knife is a powerful fighting weapon as well as a versatile cutting tool. The impressively large SK5 steel blade is ideal for defensive strikes and creating much needed space between operators and an (undead) attacker. The elongated cutting edge ends in a razor-sharp point that is capable of piercing through jackets, leather and zombie skulls. A comfortable GFN-PA66 handle feels secure in the palm while its contours offer a variety of grip positions for controlled and reliable handling.